← I’m not dead! Really! The in-laws visited this past weekend, and we did much antiquing. I scored a first printing of Rousseau’s Confessions (Volume 1), in French (like, duh), from 1782. I paid not a lot for it. Well, actually, I didn’t pay anything for it; it ended up being an early birthday present. Other than the deterioration of its leather spine, the book is in excellent condition. I’m very proud of the find. We also ate at many tasty places, and I was very full all weekend. Mmmmm. Hot Dalek action. It was the only place well-lit enough that I could take a decent photo. He was absolutely thrilled, and I was thrilled that he was thrilled, and he was thrilled that… oh, never mind. The pattern comes from here and is very easy to do. Soooo…. yeah. That’s pretty much the weekend, summed up. We got some furniture, and I made a lot of headway on the bear I’m knitting for a friend. More on that tomorrow, methinks. 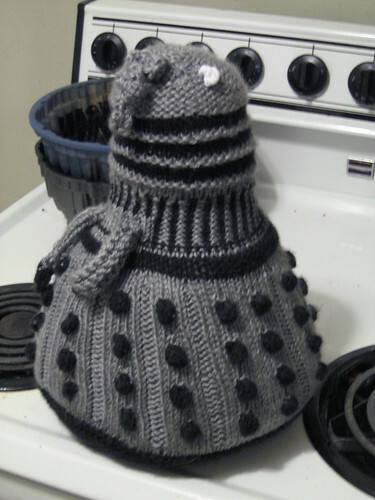 This entry was posted in General stuff and tagged family, knitting. Bookmark the permalink. 4 Responses to Daleks and other things. Thanks! It was a lot of fun to make (except for the bobbles, but now I’m really good at making bobbles). 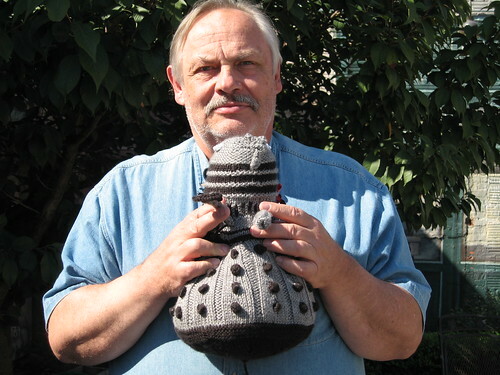 I absolutely love your Dalek!!! I am going to have to make one for my husband. He and I are both die hard Dr. Who fans.